NICCONI (AUS) (Bay 2005-Stud 2010). 6 wins-1 at 2, VRC Lightning S., Gr.1. Sire of 379 rnrs, 279 wnrs, 17 SW, inc. Nature Strip (MVRC Ian McEwen S., Gr.2), Faatinah, Sircconi, Chill Party, Nicoscene, Time Awaits, Concealer, Niccanova, Tony Nicconi, Hear the Chant, State Solicitor, Caipirinha, It's Been a Battle, Ayers Rock, Quatronic, Exclusive Lass, Loved Up, SP Lankan Star, Akkadian, Mandylion, Shokora, Fickle Folly, Bolero King, Nieta, etc. Mayan (c. by Nicconi). Winner. See below. Mighty Bender (g. by Refuse to Bend). 4 wins-1 at 2-at 1000m, 1200m, 3d ATC TAB Iphone App H., BRC Mount Franklin Sparkling H.
Dream a Lot (f. by Dream Ahead). Winner at 1000m in 2018-19 in Aust. Andaguppy (f. by Where's That Tiger). Winner at 1250m in Aust. Moon Palace (g. by Where's That Tiger). Placed at 2 & 3, 3d BRC Mount Franklin Sparkling P.
Shogun. 3 wins at 1200m, HK$2,509,950, HKJC Broadwood H., Ma Wan H., Privilege H., 2d HKJC Tai Mo Shan H., Mong Kok H., Mirs Bay H., Robin H., 3d HKJC Henan H., Crooked Island H., Black's Link H., Lei Yue Mun H., Violet Hill H.
Lucky Nemo. 2 wins at 1200m, 1600m, Southland RC Speight's H.
Sharbelle. 2 wins at 1200m, 1300m, Manawatu RC Kealls Plumbing Plus H., 2d Wanganui JC Alma Motel H.
Semi Imposing. 2 wins-1 at 2-at 1600m, 2500m, QTC Shop n Stop 2YO H., 3d QTC Australian Pork Corporation H.
Dr Haensler. Winner at 1200m, HKJC Shun Lee H., 2d HKJC Harcourt H., 3d HKJC Magnolia H.
Lady Mary (Dane Shadow). Winner at 1700m, 3d GCTC Ken Russell Memorial Classic, L, 4th BRC Lancaster S., L.
BAWALAKSANA (Straight Strike). 7 wins-1 at 2-from 1000m to 1600m, NZ$308,400, ARC Railway H., Gr.1, WRC Telegraph H., Gr.1, ARC Schofields of Newmarket H., Coca-Cola H., Avondale JC Direct Forms H., 2d Hawkes Bay GR Kelt Memorial H., L, BOP RC Stewart Browne Electrical H., 3d BOP RC Japan-New Zealand International Trophy, Gr.2, Taranaki RC Devon Hotel H., Matamata RC Watson Bloodstock H.
SHAAHEQ (Redoute's Choice). Joint third filly on 2009-10 Australasian 2YO Classification. Winner at 2, A$386,375, VRC Thoroughbred Breeders S., Gr.3, 2d MRC Blue Diamond S., Gr.1, VRC Ottawa S., L, MRC Blue Diamond Preview (f), L, Merson Cooper S., L, 4th MRC Quezette S., L. Producer. Sir Hallowell (More Than Ready). 5 wins at 1200m, A$243,263, WATC Pink's Clean Air H., Westspeed 3YO H., 2d WATC Cyril Flower S., L, 3d WATC S., L.
LUEN ON TREASURE (Dane Shadow). 4 wins from 1100m to 1800m to 2017-18 in Macau, Macau Lisboa Challenge Final, L, 3d Macau Guineas, L, 4th Macau Derby, L.
ARBEITSAM (Snitzel). 7 wins from 1200m to 2000m, A$1,129,600, to 2017-18, ATC Neville Sellwood S., Gr.3, Hawkesbury RC Rowley Mile H., L, ATC Premier's Cup Prelude H., Sydney Spring Carnival on Sale P., 2d GCTC Magic Millions Cup, RL, 3d ATC Doncaster H., Gr.1. PAYROLL (Not a Single Doubt). 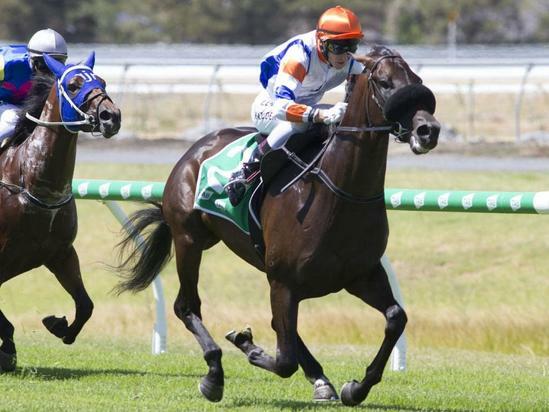 5 wins-1 at 2-from 1200m to 1800m, A$539,200, to 2017-18, MRC Eclipse S., Gr.3, Lord S., L, BRC Spear Chief H., L, 2d VRC Matriarch S., Gr.2, MRC Thousand Guineas Prelude, Gr.2, 3d VRC Blazer S., Gr.2. Choose (Starcraft). 6 wins to 1400m, A$289,820, SAJC Schweppes H., 2d MRC Mannerism S., Gr.3, Geoffrey Bellmaine S., Gr.3, 3d VRC Frances Tressady S., Gr.3. Starry Light (Danehill Dancer). 3 wins-1 at 2-to 1400m, A$111,710, AJC Balmoral 2YO H., STC Congratulations Fiumicino H., 3d Gosford Guineas, L, 4th STC Civic S., L. Producer. Kerchings (Tale of the Cat). 3 wins at 1450m, 1800m, A$76,930, ATC Coogee P., 3d VRC Fashion S., L, ATC Ascot Club P., Free Entry Today P.
Race Record: 1 Starts 1-0-0 A$27,500. Winner at 2 in 2018-19, SAJC TAB 2YO H.